Despite record numbers of patients, accident and emergency departments are struggling to recruit and retain staff, the College of Emergency Medicine says. So why are doctors leaving to find work elsewhere? "The work's better, the hours are better, the pay's better, the training's better, work's more fun and outside of work it's more fun too." Dr John Thompson, 46, trained and worked as a consultant in the A&E department at the University Hospital of North Tees in Stockton, but now works in emergency medicine in Fremantle, Western Australia. He has no regrets. Since his move in 2004, he lives a three-minute walk from the beach, gets leave when he wants it and has a "vastly superior" working environment. Unfortunately for the NHS, Dr Thompson is not alone in his decision to head to Australia for work. The number of UK medical graduates working in Australian emergency departments has risen 60% in recent years - from 251 in 2008 to 407 in 2012, according to the Australian College of Emergency Medicine. Many more A&E doctors are joining other parts of the NHS, leaving emergency departments facing a serious problem with recruitment and retention. Prof Keith Willett, NHS England's director for acute care, told Panorama that while there will always be doctors available, "we may have a situation where emergency medicine doctors are insufficient". NHS figures show a million extra people have attended A&Es in England since 2010, and the UK College of Emergency Medicine says the shortfall in the number of doctors is having serious consequences. "There's a lack of about 350 to 375 registrars around the country. That equates to three quarters of a million patient consultations per year that can't happen because those doctors don't exist," its president, Dr Clifford Mann, told Panorama. For those heading to Australia for work, the reasons are clear, says Dr Thompson. "The pressures are less in Australia and the emphasis primarily for my working day is on patient care." 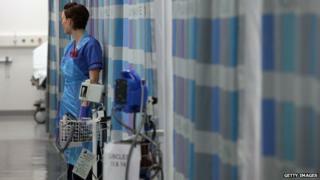 There are fewer of the targets and demands from managers that make working in the NHS "just too hard", he says. Increasingly, he meets doctors who arrive in Australia planning to stay six months, but then decide to stay on. "I would say that more than 50% now are asking how to get on to the emergency medicine training scheme because they think that's better in Australia," he says. Within the NHS itself there can also be a feeling that life as an A&E doctor is too pressured. Dr Alex Muirhead, 42, was an A&E consultant at Stockton hospital until last December. Now she is a local GP instead. "I used to love working in A&E but it got to the stage where I just didn't enjoy my job and I didn't want to spend another 20 years working as an A&E consultant. "I don't think you get an awful lot of respect from the rest of the hospital. To some extent, A&E is now seen as everyone's dumping ground." While she feels some guilt at leaving "a sinking ship", Dr Muirhead says urgent reform is needed to keep staff. The staffing problems could mean that A&E departments will cease to work properly, the College of Emergency Medicine told Panorama. "My real fear if we don't do something about recruitment and retention in emergency medicine is that you will turn up in an ambulance to an emergency department and there will be no doctors there to see you," says Dr Mann. While he does not think things will get that bad, Prof Willett agrees that action is needed. "What we will have to do in the short term is to look at how we use the wider skills that are available in the hospital... to look at the extended role of nurses, of paramedics, of physicians' assistants." The Department of Health declined to be interviewed. Panorama - 7 Days in A&E: Condition Critical?, BBC One, Monday 17 March at 20:30 GMT and then available in the UK on the BBC iPlayer.